What Next? What Path to Delight? Saturday, 11.1.2014. Three weeks before we hit the road again. What will I do? 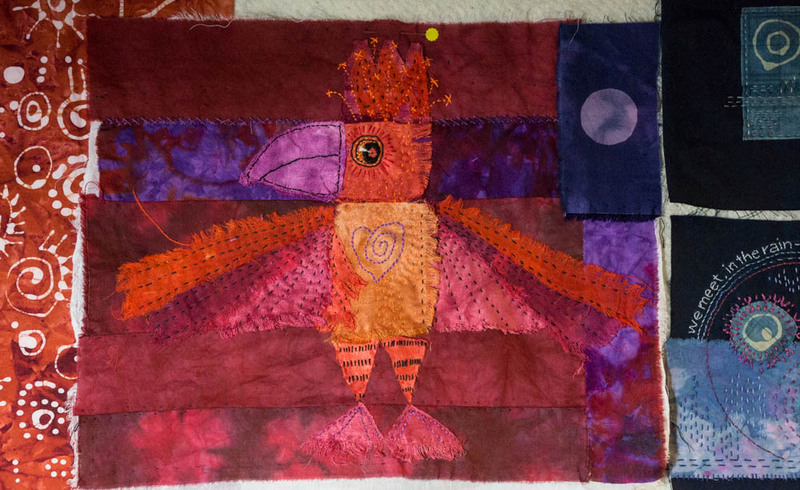 I brought fabric with me on our roadtrip and during our evening downtime, Magda the Thunder Parrot (above) began to take shape. Will she become part of a larger project or stand alone as a souvenir of October colors on the road to Santa Fe? 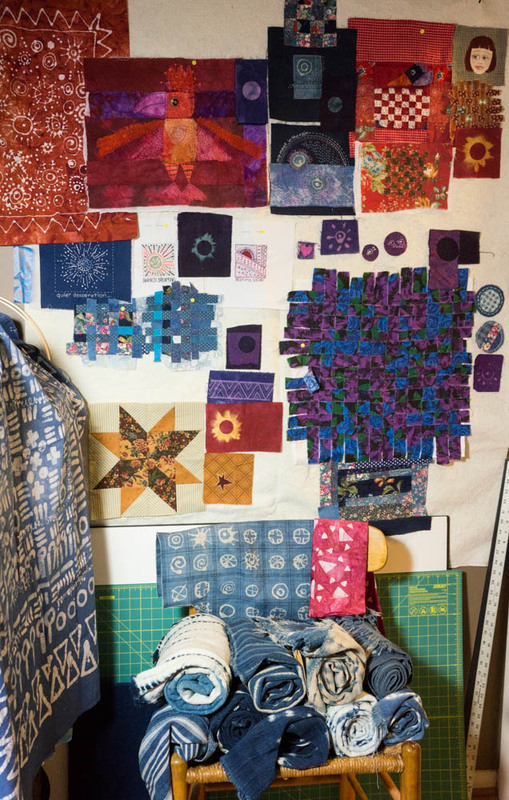 I decided to put all my scraps of this and that on my "design wall" (a rare 5-ft expanse of wall hung with some batting that small pieces will stick to -- like a primary school felt board). On the chair is my newfound stash of indigo-dyed cloth from Mali (west Africa). At a glance, maybe I have a "red" project and a "blue" project, and maybe a "purple" project in the making. In work the artist finds pleasure. The fingers run boldly, voluptuously among materials. The mind directs the completion of plans and relaxes with satisfaction. Released to stand on its own, the object preserves and projects the artist's delight. It comes upon observers as a subjective entity, a human thing, a witness to creation. Agitated into attention, observers discover the artist's pleasure in the object and repeat it within themselves. The aesthetic mission of the object is complete. It has communicated feeling. Delight begets delight. I guess if I succeed in that, I will have accomplished something.